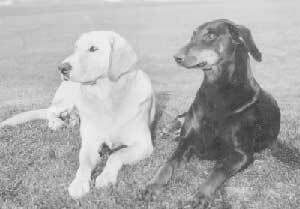 October 1950 saw the purchase of the Bucks Constabulary's first police dog - a Doberman Pinscher puppy which was bought from the Surrey Constabulary. Her name was 'Mountbrowne Jenny'. Detective Sergeant 222 Gwyn Jones was seconded to a special course at Guilford, which was home to the Surrey Constabulary's Police Dog Section, to learn how to train and handle police dogs. Jenny won many prizes and gave many demonstrations; she was even featured once by the BBC. Unfortunately she died of hardpad on the 17th December 1952. Jenny had many arrests to her credit and will be remembered fondly as the Bucks Constabulary's first police dog. Detective Sergeant 222 Gwyn Jones first joined the Birmingham City Police during 1938. The following year on the 14th August he joined the Bucks Constabulary where he worked at Headquarters (Aylesbury). In June 1943 he joined the Royal Air Force where he passed out as 'observer air crew'. 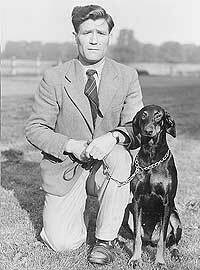 He remained in the RAF until the end of the war when he returned to the Bucks Constabulary. During both World Wars a number of police officers joined the Armed Services - all but a few returned to their police duties at the end of the war. Gwyn worked in the stores at Headquarters, Aylesbury until taking over the newly formed Dog Section assisted by Police Constable 31 John 'Kipper' Herring. Gwyn Jones took ill and died in 1955 and Sergeant 121 Ron Platt took over the section which he ran for a number of years. 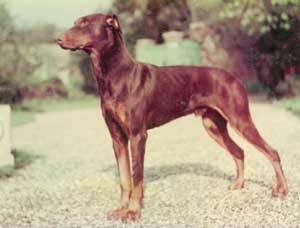 Amongst the early police dogs were 'Bob' a Golden Labrador, followed by 'Copper' who was a Doberman Pinscher. Dog handlers over the years included PC 338 George Pepper, PC 301 Harold Sibley, PC 535 William Still, PC 509 John Burt, PC 518 John Thornton, PC 94 John Weston, PC 460 Jack Raeper, PC 550 Wilf (John) Pearce, Sergeant Ken Cheetham, PC 569 Henry Plumridge and PC 493 James Cuming to mention but a few. PC John Burt, Police dogs Bryn, Troon, Shaun, N/K, Ralph, Max, Carlo, Donna, Prince, Hayden , N/K and PC John Thornton. Police Constables John Weston, Jack Raper, John (Wilf) Pearce, Sergeant Ken Cheetham, Police Constables Henry Plumridge, Harold Sibley, James Cuming and Inspector John Mathewson. 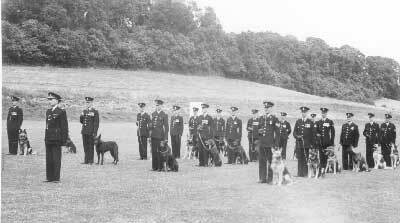 See the Centenary Parade 1957 page that shows part of the Police Dog Section.